In order to determine the influence of noise sensitivity on sleep, subjective sleep quality, annoyance, and performance after nocturnal exposure to traffic noise, 12 women and 12 men (age range, 19-28 years) were observed during four consecutive nights over a three weeks period. After a habituation night, the participants were exposed with weekly permuted changes to air, rail and road traffic noise. Of the four nights, one was a quiet night (32 dBA), while three were noisy nights with exposure to equivalent noise levels of 39, 44, and 50 dBA in a permuted order. The traffic noise caused alterations of most of the physiological parameters, subjective evaluation of sleep, annoyance, and performance. Correlations were found between noise sensitivity and subjective sleep quality in terms of worsened restoration, decreased calmness, difficulty to fall asleep, and body movements. The results suggest that alterations of subjective evaluation of sleep were determined by physical parameters of the noise but modified by individual factors like noise sensitivity. 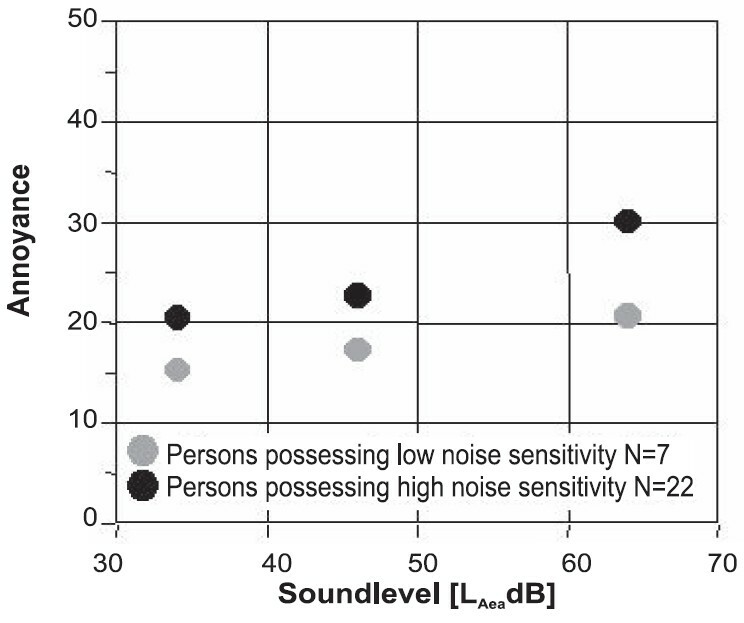 Noise sensitivity is regarded as a relevant predictor for annoyance reactions. Since many studies have focused on noise sensitivity at an international level, the present analysis was conducted to detect national peculiarities concerning noise sensitivity. Using the approach of the generalizability theory, reliability of the noise sensitivity questionnaire was analyzed taking into consideration relevant facets assumed to contribute to the measurement error. A total of 126 individuals from seven European countries participated in this study. The reliability coefficients for the global noise sensitivity score ranged from 0.90 to 0.91. It was determined that the translated questionnaires are comparable. The existing questionnaires for determining the noise sensitivity of individuals provide information only about global noise sensitivity, although empirical data suggest that measuring noise sensitivity for different situations in daily life might be more logical. Therefore, the "Noise-Sensitivity-Questionnaire" (NoiSeQ) was developed to measure global noise sensitivity as well as the sensitivity of five domains of daily life, namely, leisure, work, habitation, communication, and sleep. The assessment of the measurement characteristics was based on the Generalizability (G) theory. 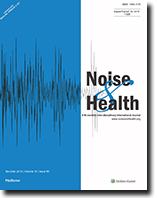 The results of the G-study (N = 66) proved that a single application of the questionnaire is sufficient for determining an individual's noise sensitivity. Furthermore, the ratings are age and gender independent. The subsequently conducted Decision (D)-study (N = 288) provides information on the reliability of NoiSeQ. If the questionnaire is used for measuring global noise sensitivity, the reliability (relative and absolute G-coefficient) reaches a value above 0.90. According to ISO 10075-3, the questionnaire satisfies the precision level 1 "accurate measurement" in this case. The G-coefficients for all the subscales exceed the lower limit 0.70, with the exception of subscale leisure, which did not prove satisfactory. 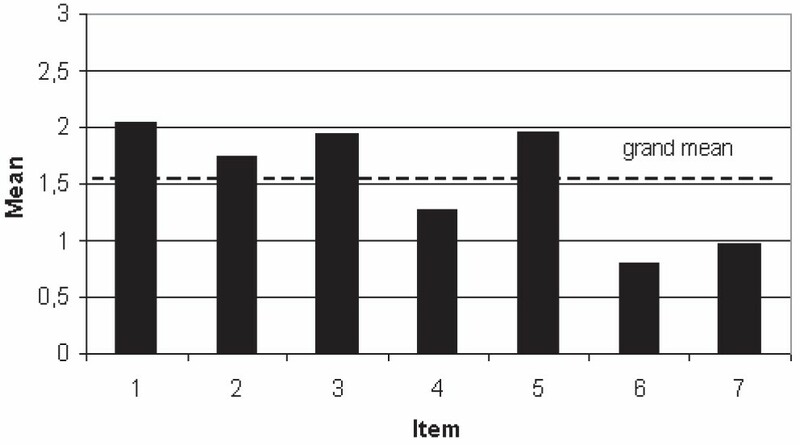 However, this subscale can reach a reliability of more than 0.70 if additional items are included. The validity of the instrument was proven for the subscales habitation (N = 72) and work (N = 72). In both the studies, the participants were asked to rate the annoyance in the presence of several rail and traffic noise scenarios. The subjects were characterized as low and high noise sensitive according to their sensitivity values obtained from NoiSeQ. In conclusion, a significant difference in annoyance rates was observed between the low and high noise sensitive groups for both the subscales habitation and work. This data support the validity of NoiSeQ.